(9) Total task dependent activities with no resources and so on. 1- Open a particular project which you want to see total number of activities. 2- Select Projects to get EPS view (see below). 3- Go to the project that you just open. 4- Then you should be able to see total number of activities for the entire project. 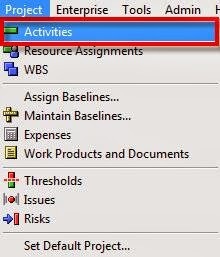 (1) Select “Total Activities” and bring it to the right side (selected options). See below. Below is a simple layout that show total project activities for an open project. Suppose you are working for multiple projects and you want to know the activities involved for those projects. 2- Go to the project that you just open. 3- Go to Group and Sort to organize EPS group. Then you should be able to see total project activities for the selected projects as below. 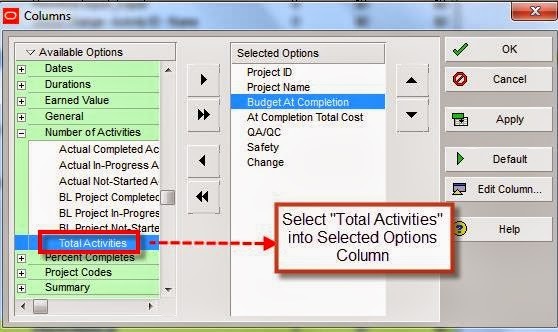 If you choose to see total number of project activities in the activity layout, you can also view total activity for each grouping as well as overall project activities. - Open a selected project and select “Activities” to view activity layout. 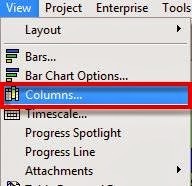 - Go to “Columns” to add “Activity Count” column into the layout. - Select “Activity Count” and bring it to the right side (selected options). Click "OK". (B) Select “Collapse To”. 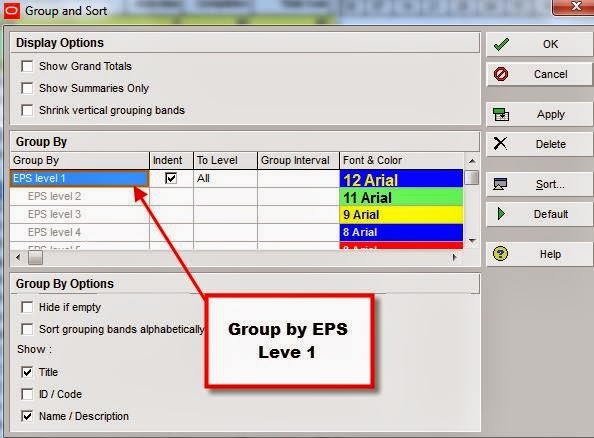 Choose WBS level2 in order to count total activities for each construction phase. However, if you want to count total number of activities for lover level WBS, then choose WBS level3, Leve4 etc. 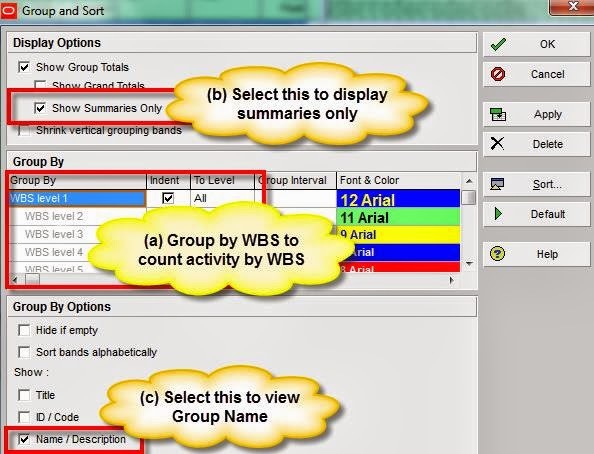 - Finally you should be able to count total activities for each WBS element as well as overall project activities. See below. Download this layout to view activity count by WBS level2. In case you want to see total activity count by Activity Code, follow the same steps as stated in Activity Count by WBS with the following changes. 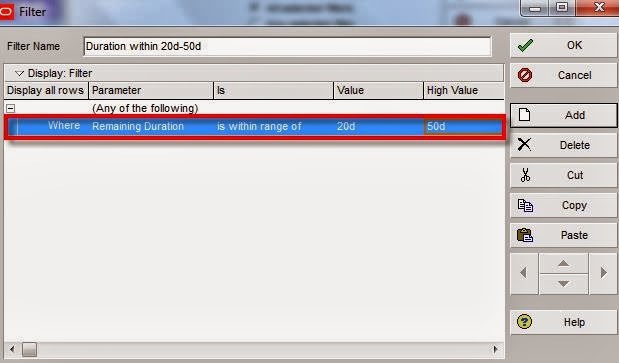 - Select the desired activity code “Item Name” for instance to demonstrate this tutorial. Enter user text instead of activity code if you also want to count activity by user text. NOTE: You don’t need to collapse grouping bands for the activity code that doesn’t have any child activity code. 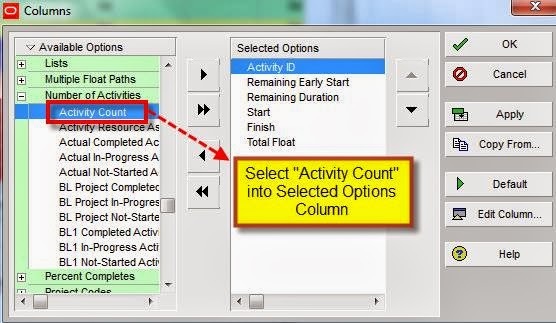 Activity code to be used for grouping must have assigned to project in order to view total number of activity count by Activity Code. I hope you learnt by now how to count number of project activity by WBS and Activity Code. Then, you can easily count activity by the type of activities available in your project. 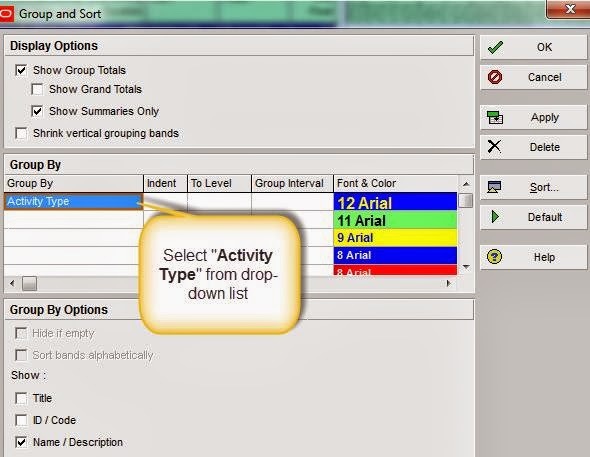 Select “Activity Type” from Group by column. See fig below. The following figure shows number of activities by each activity type (i.e. Finish Milestone, Level of Effort, Start Milestone and Task Dependent). (1) Firstly, create a filter name “No Predecessors or Successors”. 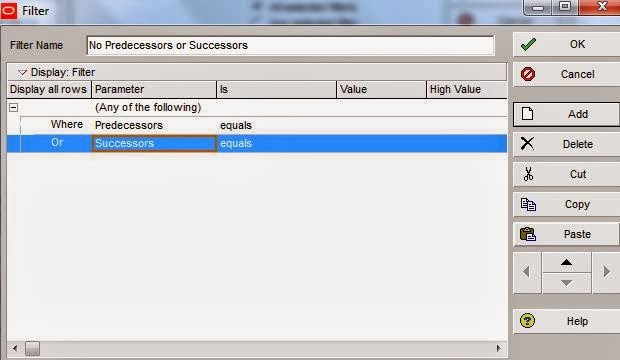 (2) Set the filter criteria: Where Predecessor equals blank (or) Successor equals blank. 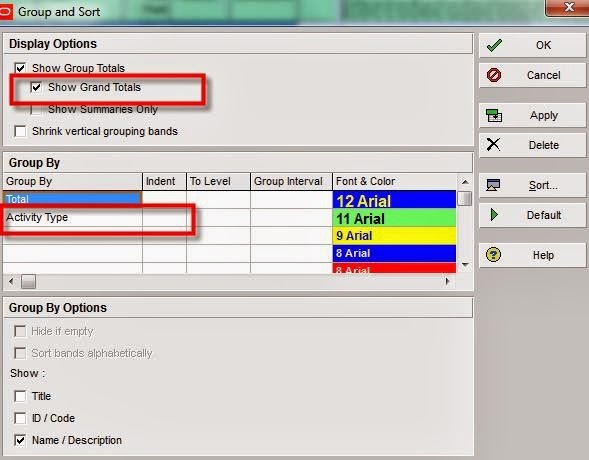 (5) Collapse activity grouping bands to “Activity Type” as below. Then, you should be able to count number of activities with broken logic (no predecessors or successors). You can also download the activity layout to view activity count for activities with broken logic activities. Import this layout back to your project for your easy reference. (3) Go to “View”> “Collapse to” so as to collapse grouping bands to “Remaining Duration”. (4) Once again, show “Activity Count” column as usual so that you can view activity count. Finally, you should be able to count number of activities by activity duration as below. In case the above criteria don’t match with the one you want to count, you can make a layout with a filter. - Show “Activity Count” Column as usual. 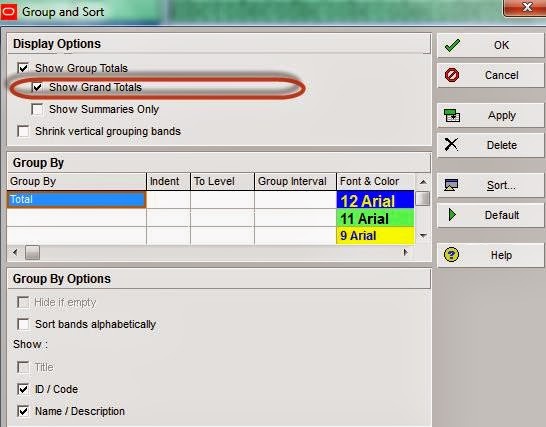 - Select Show Grand Totals in Ground and Sort window (see below). You might also want to count total project activities that contain certain keyword in the activity names. If activity descriptions have been designed consistently in your project, it is very handy to use this layout. - Create a filter that named “Activity Name contains IFC”. 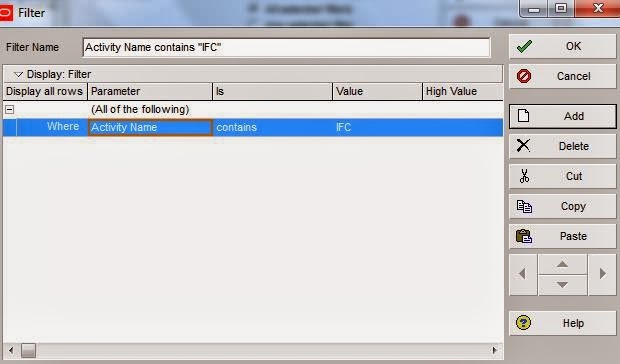 - Set the filter criteria: Where “Activity Name contains IFC. 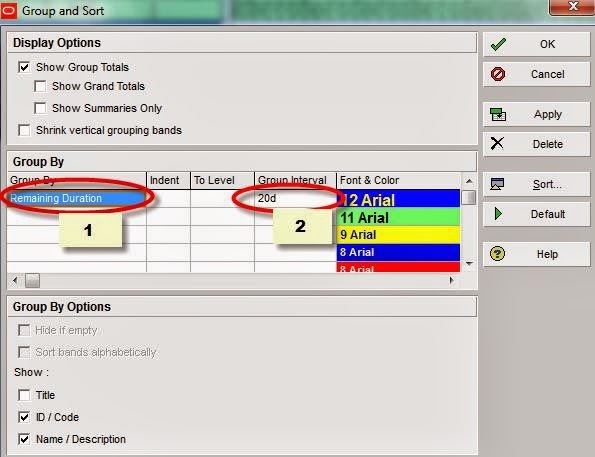 - Select Show Grand Totals in Ground and Sort window. - Finally, you should be able to see total activity count that contains certain keyword (e.g. IFC) as below. Note: If you want to return more result, for instance, you want to count total activity that contains either IFC or IFD, and then add new line and use “or” function (see below snapshot). Summary: You can view number of project activities in various ways with the helps of Filter and Group and Sort function in the activity layout. 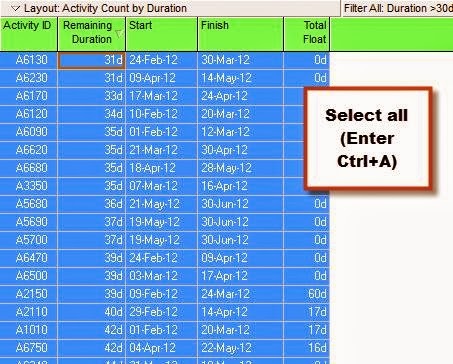 You can count number of activities in Excel by exporting data to Excel. 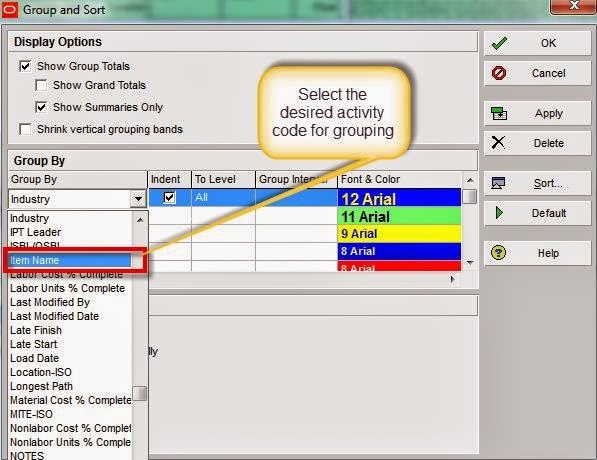 Group and sorting function doesn’t require if you choose to use this method. This is quick and easy way to count number of activities. For instance, you want to count activity with duration greater than 30 days. - Create a filter that named “Duration>30d”. 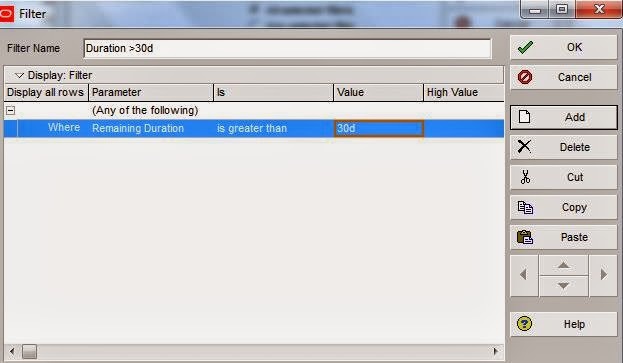 - Set the filter criteria: Where “Remaining Duration is greater than 30d”. - Apply filter and see the result. Once you have applied filter, select all data (Enter Ctrl+A). Conclusion : You can view total activity count in EPS view. 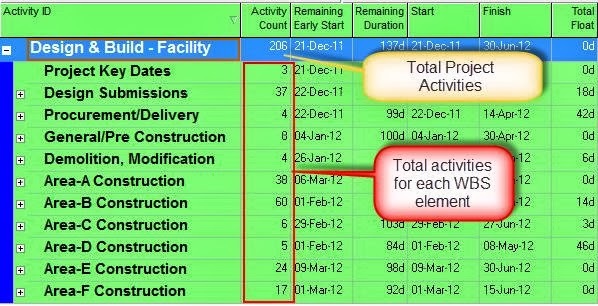 Total project activity count and subtotal count grouped by WBS, activity code, activity type, activity duration and activity name's content can be viewed in the activity layout. You can also view activity count in Excel via P6 export data. P6 Question: How can/Could you show the 'Total Activities' in the footer. Hi there, you won't be able to shown total activities on the footer of excel sheet or pdf from P6 automatically. You have to enter them manually.